Above: one of the finest books printed in the Italian Renaissance, and indicative of the cosmopolitan spirit spreading from Rome. 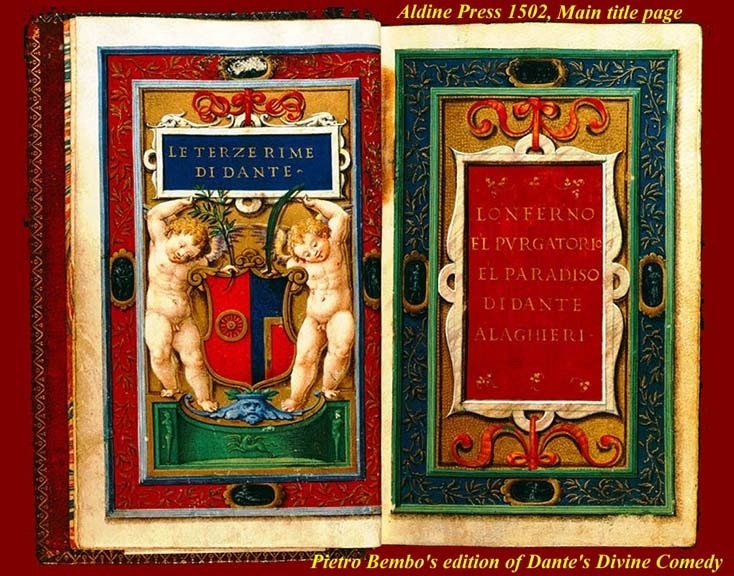 Dante's Divine Comedy -- Written by a Florentine, edited (=presented, i.e., made authentic and whole) by a Roman humanist (Pietro Bembo), and printed in Venice (at the Aldin Press of Aldo Pio Manuzio.) The intense colors are often referred to as "Venetian". "Terze Rime" (in the box on the "cupids" page -- actually they are "putti") is a rhyming system involving "tercets" -- three line groups (just as "couplets" have two lines). The rhyme system is ABA BCB CDC DED EFE FGF GHG HIH , etc. : The first and third lines of any tercet had to rhyme with the second line of the preceding tercet. Lines had ten or eleven syllables and consistency in the number of syllables was valued. Philology = study of and commentary on ancient texts. In Rome, it was initially oriented toward biblical and patristic texts. The main idea was to strip away Medieval nonsense. Latin, Greek, and Hebrew linguistics. To get the texts right, you had to know the languages, and both denotation and connotation were important. To learn the languages you had to study other (non-religious) classical literature. And two things became apparent almost immediately: (1) Patristic language use was vastly substandard (Jerome's Vulgate (Latin) Bible, for example, was in really low class Latin, and it may have been intentionally so to make it more "accessable"); and (2) the non-religious classics were deeper and more interesting. Sibyline parallels. It didn't take long before Sibyline prophecies had equal weight with biblical ones. Parallels were rife, and with imaginative interpretation (and a little squinting of the eyes) you could determine that the Sibyls had predicted the coming of Christ and many other religious events. This was immensely popular with the Romans and other Mediterranean types, but the northerners thought it was absurd and, ultimately heretical -- one of the complaints of the Protestant reformers. Cicero's Latin. Whatever you wrote about, analyzed, recast, it had to be in correct and elegant Latin (initially -- later, equally "correct" and elegant Italian was needed) and the only really correct Latin was Cicero's. Why his? Because he had polished, re-edited (i.e., after delivery), and self-published and publicized every speech he had ever given. He was the consumate self-promoter, sending, for example, free copies of his emmissions to the rhetorical schools in Roman cities. Even in his own time he had been known as the standard in eloquent oratory. Getting beyond the ancients. Some humanists decided early on that there were new, or at least more important, subjects worthy of their talents. This often amounted to whatever a patron might pay for. Manuscript to print-run. First, writing in the author's own hand -- old books might be copied by a scribe, but interpretation, correction (i.e., removal of acretions and scribal errors) required a humanist philologist. Original material was written by the author and then handed to trusted scribes who could make presentation copies for the patron to have and hold or to distribute. The arrival of the printing press changed the dynamic. There were still commissioned books, but the commission might be for a work to be printed rather than copied by hand. Many more copies were available. Aldo Pio Manuzio and the Aldine Press in Venice, and his competition. Neo-Latin writings and high class vernacular. Bessarion and the reintroduction of Platonism and other Greek stuff. Pseudonymic writing to avoid the attention of the Inquisition. You could go too far, and if you did it was better to do so anonymously. Mysterious Palingenius, the "eastern mage". Burning Pierangelo Manzolli's bones. Slipping into the back door of heaven: Pietro Bembo reformed and reinvented. After a raucous, sordid, "pagan" life and "indexed" (condemned) works, at 69 he is made a Cardinal and devotes his last years to religious subjects. Raffaello Maffei: a type -- kept his nose clean and is unknown. Women and poetry. Not content to be the subject of male poetry, some women wrote their own, and did it equally well: Veronica Gambara, Vittoria Colonna, and the "infamous" Veronica Franco. http://www.uni-mannheim.de/mateo/desbillons/aport.html Boissard/Bry engravings of Renaissance personages, including some of our literati. http://math.dartmouth.edu/~matc/Readers/renaissance.astro/0.intro.html heliocentrism and its progress. one of the subjects of Renaissance literature -- Palengenius, for example, covered the subjec taking, essentially, the heliocentric line, and that's probably why they burned Manzolli's bones. http://www.loc.gov/exhibits/vatican/humanism.html the Rome Reborn on-line exhibition of Renaissance books, mounted by the US Library of Congress and the Vatican Library. http://andromeda.rutgers.edu/~jlynch/Papers/dict2.htmlFalse Refinement and Declension:Johnson on the History of the Language, a paper by Jack Lynch, delivered at Samuel Johnson and the Languages of Literature: The First Annual Conference of the Johnson Centre, 12 September 1997, Birmingham, UK. Women Poets: http://home.infionline.net/~ddisse/index.html -- links to passages from over 125 women writers. The entries are on women who produced a substantial amount of work before 1700, some or all of which has been translated into modern English. Each entry will tell you about the print sources from which the translated passages are taken; it will also tell you of useful secondary sources and Internet sites, when those are available.